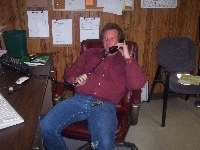 JACKIE "HAMMER" JOHNSON IS THE FOUNDER AND OWNER OF DIXIELAND TRUCKING CO. JACKIE STARTED THE COMPANY IN 1991 AND THROUGH GOOD CHARACTER, HONESTY, HARD WORK, AND THE BELIEF IN TREATING THE OTHER MAN AS HE WOULD LIKE TO BE TREATED, HAS GROWN THIS COMPANY FROM A ONE TRUCK OPERATION INTO THE TWENTY FIVE TRUCK OPERATION THAT IT IS TODAY. DIXIELAND HAS 3 FULL TIME OFFICE EMPLOYEES, 3 COMPANY TRUCKS, 26 OWNER OPERATORS, AND 2 BRANCH OFFICES THAT ARE READY TO SERVE THE NEEDS OF ANY CUSTOMER. WE ARE HOUSED IN A 100' X 175' SHOP AND WAREHOUSE WITH 1000 SQUARE FEET OF OFFICE SPACE. JACKIE IS EAGER TO ANSWER ANY OF YOUR QUESTIONS AND TO HELP YOU GET YOUR FREIGHT MOVED. HE MAY BE REACHED AT EX. 101 IN THE OFFICE, BUT YOU WILL FIND HIM MOST OF THE TIME ON HIS CELL PHONE AT 662-401-7017, BEHIND THE WHEEL OF ONE OF HIS "GOOD OL TRUCKS". JACKIE IS ALSO AN AVID MUSICIAN. HE WROTE, COMPOSED, AND RECORDED THE SONG THAT YOU HEAR WHEN YOU OPEN THIS PAGE. YOU CAN ALSO HEAR OTHER SONGS THAT HE HAS WRITTEN BY VISITING http://www.tombigbeejamboree.net/ THANKS TO ALL FOR DOING BUSINESS WITH DIXIELAND TRUCKING CO.